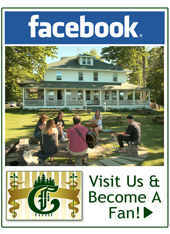 Welcome to our Eastern Upper Peninsula Attractions, all within 60 miles of Chamberlin's Ole Forest Inn of Curtis, Michigan. Explore our endless array of nearby attractions, including waterfalls, lighthouses, rivers, springs, museums, tours, our pristine lakeshores, and more. The Norther Hardwoods cross country ski trail offers miles of fun for skiers of all ages and abilities. The Northern Hardwoods Cross-Country Ski Area offers skiers over 9 miles of groomed trails. Explore the beauty of the Northwoods as you ski through a mature stand of sugar maple, beech, and yellow birch. View magnificent old growth forest, marshes, and the frozen beauty of the Manistique River. Novices and advanced skiers alike will discover trails that are challenging, fun, and full of wildlife. Take a dog sled ride or tour. Take the trip of a lifetime! Join us for our seventh season of unforgettable winter adventures! Owners Ed and Tasha Stielstra invite you to share a bit of sled dog magic! Reserve your trip now for the 2009-2010 season! New trips, new schedules, and excited sled dogs! A 6 1/2 hour combination narrow gaugetrain and river boat cruise to our private acess at the Upper Tahquamenon Falls. Great way to observe fall bird migration and colors. Family owned and operated. Family packages available. Enjoy the lumber jack breakfast held once monthly starting in May and running through October. This is held in the Old "Cook Shack". Tour the CCC (Civilain Conservation Core) building. Follow the Nature Walk along the Tahquamenon River. View the one room school house and the many early logging implements. Tahquamenon Falls State Park encompasses close to 52,000 acres stretching over 13 miles. Most of this is undeveloped woodland without roads, buildings or power lines. Centerpiece of the park, and the very reason for its existence, is the Tahquamenon River with its waterfalls. The Upper Falls on the Tahquamenon River is one of the largest waterfalls east of the Mississippi. It has a drop of nearly 50 feet and is more than 200 feet across. A maximum flow of more than 50,000 gallons of water per second has been recorded cascading over its precipice. There is a paved pathway (.4 mile) that leads from the parking lot at the Upper Falls, through an old growth forest to the observation platforms at the crest of the Falls and is handicap accessible. Steps lead to the bottom of the falls where the water crashes into the Tahquamenon River. There is a 4 mile hiking trail along the river to the Lower Falls. Four miles downstream from the Upper Tahquamenon Falls the Tahquamenon river rushes it's 50,000 gallons of water per second around a good size island where it is then broken into 2 distinct waterfalls cascading around opposite banks of die island. Each falls has a drop of 22ft and a width of over a 100 ft. Although the Lower Falls can be viewed from many interesting observation points on the mainland, visitor's can opt to visit the island by renting a rowboat from the Lower Falls Concession. Accessing the island is a great opportunity for visitors to afford a good view of the falls in the south channel and explore it up close. Big Spring, Kitch-iti-kipi is Michigan's largest spring. Delivering over 10,000 gallons of water per minute, this 200 foot wide, 42 foot deep spring is one of the crown jewels of Schoolcraft County. Visitors to the park can experience the beauty of the Big Spring up close from the newly renovated raft. Viewing portals allow one to see the boiling sands where the spring water erupts from underground and large trout. Unique Native American legends surround this spring, interpretive signs, peaceful setting, picnic area and gift shop all add to this special natural attraction. Crisp Point was one of five Lake Superior U.S. Life-Saving Service Stations along the coast between Munising and Whitefish Point. It is located about fourteen miles west of Whitefish Point. It was built in 1875 and became operational in 1876 as Life Saving Station Number Ten, of the U.S. Life-Saving Service District 10 (it was later part of District 11) . Crisp Point inherited its name from one of the Life Saving Station keepers, an iron-willed boatman named Christopher Crisp. The other four Life-Saving Stations were Vermillion Point (now Vermilion), Two Heart River, Deer Park (formerly Sucker River Station and Muskallonge Lake Station) and Grand Marais. Crisp Point Lighthouse was first proprosed in 1896 and every year thereafter until finally approved in June of 1902. The land was purchased--fifteen acres--at a price of $30.00. The deed was dated May 21, 1903. Bears roam freely within three well maintained natural habitat. Walk the perimeter of each habitat and learn the incredible story behind this rescue ranch. While strolling the grounds, Oswald will point to each of his 23 grown North American Black Bears and list their different personalities, names and even their weight. Open daily from Memorial Day weekend through September. This complex is the Largest (bear only) Bear Ranch in the entire United States! We are found only in the Wild Upper Peninsula of Michigan. This trail is quiet and less manicured, but still offers a high level of quality skiing. Looking for a quieter, less manicured alternative to those highly groomed trails without sacrificing quality? McKeever Trail offers 3 loops, ranging from easy to difficult, with challenging hills and beautiful vistas around Pete's McKeever, Wedge and Kimble Lakes. Location: From the intersection of M-28 and Forest Highway 13 (just east of Munising) drive south 12 miles on FH 13 to the parking area on the east side of the road. You can also ski out the door onto the trail from the rental McKeever Cabin. This trail offers a 7.25-mile loop ideal for biking, hiking, or snoweshoeing. Bruno's Run Trail offers a 7.25-mile loop that is idea for hiking or biking in the spring, summer, and fall, and snowshoeing in the winter. Winding its way past a host of small lakes etched in this glacial plain, the trail runs over smooth foothills, along outlooks and throuh valleys. The many lakes and streams in the area and its variety of trees and other plants make it likely that those who travel it will spot wildlife or signs of thier coming and going. From the intersection of M-28 and Forest Highway 13 (just wast of Munising) drive south 10.2 miles to Moccasin Lake Roadside Rest. The trail can also to accessed from Pete's Lake and Widewaters Campgrounds. Situated atop a 175 foot cliff on Grand Island’s north end, this lighthouse has been identified as the highest lighthouse about sea level in the United States. Originally built of wood in 1856, this remote lighthouse was a key navigational marker during the trading boom that followed completion of the Soo Locks in 1855. With an ideal safe harbor in the bay on the island’s lee side, Grand Island has long been a primary stopping place for Native Americans, traders and others plying Lake Superior’s south shore. In 1867, the already-deteriorated wooden lighthouse was replaced with the current brick lighthouse, consisting of a simple brick keeper’s house and a 40 foot tower. It was automated in 1941. Location: The privately owned lighthouse is not accessible by land, but may be viewed by commercial airplane tours or by private watercraft. Consult the local marine forecast before venturing onto Lake Superior as weather conditions may change rapidly. This byway allows you to escape to shores and beaches. The Whitefish Bay Scenic Byway allows you to escape to the shores of Lake Superior for a relaxing drive or exploration of scenic sand beaches. The byway begins just north of Brimley on Curly Lewis Memorial Highway also known as Lake Shore Drive. The two lane road passes through a hardwood forest of birch, maple, and oak, which blaze red, orange, and gold during late September and early October. After the intersection with Rexford Road (FR 3157) there are several paved parking pull offs and white sand paths to the lake shore. Plan to spend time walking the beach, wading in Lake Superior, or having a picnic. The North Country National Scenic Trail follows the shore with frequent access points from the byway. Location: From the intersection of M-28 and I-75 drive 7.5 miles west on M-28 to M-221/Brimley. Turn right (north) and drive 2.5 miles on M-221 to Lake Shore Drive. This lighthouse was originally built in 1855 and ran for over 100 years. The name "Point Iroquois" originates from a 1662 battle between the Ojibwa and Iroquois tribes. This light station is located at the mouth of the St. Mary's River and Whitefish Bay, marking the narrow channel between them. The St. Mary's River is the only water connection between Lake Superior and the rest of the Great Lakes. Originally built in 1855, the 1902 version of the light station was able to house the head keeper, two assistants, and their families. After over 100 years of service, the light at Point Iroquois was replaced in 1962 with an automated light in the Channel of Gros Cap. 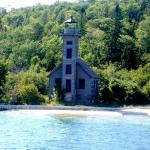 The light station became property of Hiawatha National Forest in 1965. In 1975 it was placed on the National Register of Historic Places. Through the efforts of the U.S. Forest Service and the Bay Mills/Brimley Historical Society, the light station was restored for all to enjoy. Visitor donations help maintain this beautiful and historic site. Volunteer caretakers are on-site year round. This light station is open to visitors May 15th through October 15th from 9:00 a.m. - 5 p.m. On your visit, you may climb the 72 steps up the spiral staircase in the 65 foot tower. There is a museum and a gift shop accessible to you if you wish to do some additional research and buying. Location: From the intersection on M-28 and I-75, drive 7.5 miles west on M-28 to M-221/Brimley. Turn right (north) and drive 2.5 miles on M-221 to Lake Shore Drive (Forest Highway 42). Turn left (west) on Lake Shore Drive and drive 6.5 miles to the lighthouse. This small, wood frame lighthouse resembles a small country church. The small wooden frame lighthouse on the southeast shore of Grand Island was constructed during the period 1869-1870 for the purpose of guiding vessels into Munising Harbor from the east. The land was one of a number of parcels reserved in 1847 for government use. Resembling a small country church in style, its original color is white. The location, opposite the dangerous shoal at Sand Point, was critical for safe navigation. By 1905, the Lighthouse Board noted that the light was no longer serving its original purpose, considering the difficulties in maintenance and the mariner's desire for improved range lights. Its abandonment was only a matter of time. The light was finally abandoned in 1913 as a result of the construction in 1908 of improved range lights, purchased and divided into lots. Location: It is located on private land and cannot be accessed by land. However, many people view the light by taking one of several commercial boat or airplane tours or by private boat or kayak. Many people drive right by this lighthouse without even noticing it, so watch closely! These lights are tucked away in the Hiawatha National Forest, among the tag alders and swamp conifers south of M-28 near Christmas. This is the Grand Island Harbor Rear Range Light, sometimes known as the "Bay Furnace Light" or the "Christmas Light." The light tower is about 62 feet tall and is constructed from quarter-inch steel plates riveted by six 4x4 inch metal struts. It was built in 1914, replacing a wood frame structure that was constructed in 1868. The official Coast Guard Light list for 1915 indicates it contained a 1,500 candle power light, which was visible for 16 miles. Range lights were designed to work in pairs. By keeping the rear range light aligned with the front range light, mariners were able to stay on the proper heading through the narrow channel west of Grand Island which leads to Munising Harbor. The rear range light was abandoned about 1969, and in 1977 the parcel of land was declared surplus by the Coast Guard and transferred to the Forest Service. Location: From the intersection of M-28 and H-58 in Munising drive 3.5 miles west on M-8 toward Christmas. The Rear Rang Light is on the south side of the road opposite the "Welcome to Christmas" sign. Tours of the Rear Range Light are available seasonally. Please contact the Munising Visitor Center for more information. Watch as history comes alive as you discover turn-of-the-century shipwrecks preserved by Lake Superiors frigid waters. While aboard the Miss Munising or the Fireball, view these doomed vessels that lay on the bottom of the bay where they met their fates when the tempestuous lake displayed its violent powers. This two-hour tour covers a distance of about 10 miles and features sights both above and below the water. For years vessels could only be seen by divers, but now, through specially designed through-the-hull glass viewing areas, everyone can experience the amazing shipwrecks. With up to 50 feet of visibility, its clear viewing of the Bermuda, the Scow Schooner, and the Herman H. Hettler. Saturday before Memorial Day through first week of June: 1:00 pm. Remainder of June: 10:00 am & 1:00 pm. July, August through Labor Day (Sept. 6): 10:00 am, 12:30 pm, 1:00 pm, and 4:00 pm. Remainder of September: 10:00 am & 1:00 pm. October 1 - 10th: 1:00 pm. The amazing Pictured Rocks stretch for about 15 miles along Lake Superior. The Pictured Rocks stretch for about 15 miles along Lake Superior from Sand Point on the west to just after Spray Falls on the east. Colorful and bold, the Pictured Rocks tower 50 to 200 feet directly from Lake Superior. The name "Pictured Rocks" comes from the streaks of mineral stain that decorate the face of the weather-sculpted cliffs. Sandstone cliffs of ochre, tan, and brown - sandwiched with layers of white, green, orange, and black - glisten against the cloud-streaked sky and clear waters of Lake Superior. Miners Castle provides a wonderful vista of the Pictured Rocks cliffs. At Sand Point, the cliffs are off in the distance. The North Country National Scenic Trail extends the length of the lakeshore, providing beautiful views along the trail for both backpackers and day hikers. Trails to the beach overlook Chapel Lake with views of the beautiful Chapel Falls on the west side. Located about 15 miles east of Munising off Alger County Road H-58, then about 5 miles north to the end of Chapel Road (drive), then 2.5 miles (hike) to Lake Superior. The Chapel area was named by early European explorers and is found on early maps as La Chappelle. Chapel Rock is a remnant of Cambrian age sandstone. The archway between the rock and the mainland collapsed in the 1940's. It and the remaining arch were carved by Lake Nipissing high waters some 3800 years ago. Chapel Beach is also a remnant of Lake Nipissing, blocking Chapel Creek to form Chapel Lake. The area invites hikers and boaters to linger, and a popular backcountry campsite is found here. Legend has it that logs sent down the dry log chute would generate enough friction to cause the chute to catch fire. Located about 7 miles west of Grand Marais on Alger County Road H-58, then almost 1 mile north on Log Slide Road. Today the chute is gone, but the lumberjack stories still linger as you gaze out over the Grand Sable Banks and Dunes. This is a good place to glimpse the Au Sable Light Station to the west and the Grand Sable Banks and Grand Marais to the east. This beautiful beach stretches for one mile along Lake Superior. Located about 6.5 miles east of Munising on Alger County Road H-58, then six miles north on Miners Castle Road. A picnicker and beach walker's delight, Miners Beach stretches for one mile along Lake Superior where waves roll in to polish beach cobbles. Miners River is popular for steelhead fishing in spring and fall. **Whenever at a beach, be aware of rip currents, powerful currents of water moving away from shore. They can sweep even the strongest swimmer out to sea. This beach is a popular spot to walk along and to watch the sunset over Lake Superior. The Sand Point beach is a popular spot for walking in the evening to watch the sun go down over Munising Bay. Beach enthusiasts enjoy the long expanse of Lake Superior shore, though the water is often too cold for even the hardiest swimmers. The Sand Point Marsh Trail, a half-mile disabled accessible interpretive trail, features a large print brochure for visually impaired visitors. Sand Point is a good place to look for warblers in spring and fall. Nearby at former Munising U.S. Coast Guard Station, a 36-foot self-righting motor lifeboat is on display in the boathouse from May through October. Park headquarters is also located on Sand Point. Located about four miles northeast of Munising, at the end of Sand Point Road. Spray Falls - Pictured Rocks National LakeshoreThis remote waterfall cascades directly into Lake Superior. A shipwreck lies at the base of these falls in 20 feet of water. This remote waterfall is best viewed from the water though it may be seen from along the North Country Trail. Spray Falls plunges about 70 feet over the Pictured Rocks cliffs directly into Lake Superior. The 1856 shipwreck "Superior" lies at the base of the falls in 20 feet of water. Located about 1.75 miles northeast of Chapel Beach. Sable Falls tumbles 75 feet over several cliffs. Sable Falls tumbles 75 feet over several cliffs of Munising and Jacobsville sandstone formations on its way to Lake Superior. The first viewing platform is down a staircase with 169 steps. The hike from the parking area to this staircase steps is short. The trail continues past the falls and down the canyon. It is about a half-mile to the beach as Sable Creek as it winds its way to Lake Superior. Pets are not permitted on the Sable Falls trails, but are allowed in the parking lot and picnic area. A brisk 1.5 mile walk past abundant stands of jewel weed, leads hikers to view the 60 foot high Chapel Falls. The trail is on an old roadbed with several small hills. Two viewing platforms along the way provide views of the scenic Chapel Basin. The trail continues to Chapel Rock and Lake Superior. Located about 15 miles east of Munising off Alger County Road H-58, then about 5 miles north to the end of Chapel Road. Pets are prohibited on all trails in the Chapel area. This is a lovely springtime trail through the forest carpeted with wildflowers. Located about 15 miles east of Munising off Alger County Road H-58, then about 5 miles north to the parking area at end of Chapel Road. Walking toward Mosquito Beach, a side trail leads .9 miles to the falls, which drops over an 8 foot high rock shelf on the Mosquito River. Watch for river otter and beaver in the stream. Pets are prohibited on all trails in the Mosquito area. Bridalveil Falls are only viewable by water or from a distance at Miners Castle. This is a seasonal waterfall that slows to a trickle in the summer and fall. Bridalveil Falls is often featured on postcards and publications about Pictured Rocks National Lakeshore. The Miners River drops about 50 feet over a sandstone outcrop, creating this gorgeous waterfall. Located about five miles north of Alger County Road H-58 off Miners Castle Road. The hike from the parking area to the waterfall is 1.2 miles round-trip. A gravel path through the northwoods leads to two overlooks. The Miners Falls Nature Trail views the Miners Basin along the way. The Miners River drops about 50 feet over a sandstone outcrop, creating this gorgeous waterfall. There are 77 steps down to the lower viewing platform at the falls. This is an especially beautiful trail in the springtime with abundant wildflowers. Pets are not permitted on the trail to Miners Falls, but are allowed in the parking lot and picnic area. This easily accessable waterfall is nearly 50 feet tall and only 2 miles from downtown Munising. This waterfall is a part of the Pictured Rocks National Lakeshore. 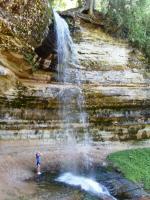 Walk the paved .25 mile trail up the cool shaded sandstone canyon along Munising Creek to the base of the falls. Two sets of stairs lead to platforms to view the 50 foot waterfall as it drops over a sandstone cliff. Watch for ferns, wildflowers, and an occasional mink. The trail is fully accessible to the central falls viewing platform. Please stay on the paved trail. Pets are permitted on the trail to Munising Falls. Miners Castle is one of the icons of Pictured Rocks National Lakeshore, towering for centuries along the shoreline. Located about 6.5 miles east of Munising on Alger County Road H-58, then five miles north on Miners Castle Road. Miners Castle is the most famous formation of the Pictured Rocks, and is accessible by vehicle and short trails. Beginning at the picnic area, a paved foot trail leads past interpretive exhibits to breathtaking overlooks of Lake Superior and Grand Island. Stairs and a steeper trail lead to the lower overlook adjacent to Miners Castle. There are many things to do here, besides taking great pictures:Hike to the three overlooks, picnic here while watching for a bald eagle, hike to Miners Beach (pets prohibited), drive to Miners Beach, hike to Miners Lake (pets prohibited), hike to Sand Point, hike to Mosquito Beach (pets prohibited). Discover the natural wonders of the water on this incredible journy through Lake Superior. Be sure to bring your camera! This 2 1/2 to 3 hour cruise along Pictured Rocks National Lakeshore shows the crystal clear waters of Lake Superior and the masterpieces of colors and rock formations found nowhere else in the world. The boat cruises have been operating for over 50 years, and specialize in comfort and safety. The tour is 37 miles long, and passes points such as Lovers Leap, Grand Portal, Miners Castle, and Indian Head. All the points are described by your captian. One daily cruise passes by Spray Falls. (Please call or see the current schedule for times.) There is no additional charge for the Spray Falls trip. All vessels have enclosed heated cabins, restrooms, stabilizers and cushioned seats for your comfort and safety. On site kennel services are available free of charge. Operates rain or shine - lake conditions permitting. Refunds: You will get a 50% refund or a free future ticket (your choice) if the tour makes it to East Channel Light House and Miners Castle but does not make a complete trip because of the weather. Trips that do not make it to Miners Castle will be given a full refund. The Pictured Rocks cliffs give way to this isolated beach. Located along the Lake Superior shoreline; access at the Twelvemile Beach Campground, about 16 miles west of Grand Marais on Alger County Road H-58.The beach continues until the Grand Sable Banks rise high above Lake Superior near Grand Marais. Twelvemile Beach is a wonderful place for long walks along the shore. These dunes are among the best examples of perched dune systems in the world. Five square miles of Grand Sable Dunes are perched atop the 300-foot high Grand Sable Banks. Left by enormous glaciers, the Grand Sable Dunes dwarf comprehension. The dunes are a part of Pictured Rocks National Lakeshore. Located about one mile west Grand Marais; the best place to view is from the trail beginning at the Sable Falls parking area. Melting glacial ice within the Superior Basin produced huge rivers that deposited millions of tons of pulverized rock rubble in various configurations to the south of the Superior Basin.As ice retreated completely from the Superior Basin, water levels receded rapidly northward, leaving the Pictured Rocks area "high and dry" about 9500 years ago. It truely is an amazing sight to see. Located along Pictured Rocks National Lakeshore, this light station was built in 1873. Located along Pictured Rocks National Lakeshore, this light stands on Au Sable Point on the south shore of Lake Superior, approximately 12 miles west of Grand Marais.This light tower's base diameter is 16 feet with a height of 87 feet. The lens focal plane is 107 feet above lake level.The orignial two-story keepers dwelling was attached to the light tower in the back. In 1909, the building was added on to the front so it would accommodate two families.Tours are scheduled Wednesday through Sunday beginning June 3 through September 6. No tours run on Mondays and Tuesdays. The tour lasts about 30-40 minutes and are guided by a Park Ranger. Tour Fee: $3.00 for those 6 and older. 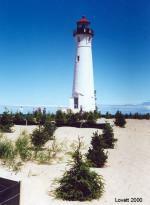 The East Breakwater Light, built in 1916, is 35 feet tall and stands at the harbor entrance of the Manistique River. Soon to be listed in the National Register of Historic Places, the Light continues to guide vessels traversing the Great Lakes. Built for visitors and residents alike, the boardwalk extends over 2 miles along the sandy shores of northern Lake Michigan. Interpretive signs placed along this wheelchair accessible path inform visitors of the sites and natural elements around them. Along the way enjoy the picnic area, fishing pier and photo perfect view of the East Breakwater Light. Hike, bike, explore ~ nature at its best! Located 1/2 mile off the mainland, Grand Island is owned and managed by Hiawatha National Forest and most of the 21-square-mile island is available for exploration. Regularly scheduled ferries transport guests from Munising to Williams Landing. No cars are allowed - the best way to enjoy the island is by bike. Renting is available for those without their own bike. A 23-mile trail offers hikers and bikers lakeshore access to 300-foot cliffs and long sandy beaches. This rustic Island offers visitors a wide range of primitive experiences and forest activities. Grand Island is located in Lake Superior, about one-half mile from the mainland community of Munising, Michigan. The island's scenic natural beauty and interesting history make it an attractive place for camping and other outdoor activities. Take a trip back in time on a guided tour of the fully restored 1861 Lightkeepers Quarters. You'll hear first-hand accounts of keepers and their families who manned this side-by-side duplex building while tending the light. The Lightkeepers Quarters features period furnishings, descriptive panels, and artifacts from the days of the U.S. Lighthouse Service and the U.S. Life Saving Service.